The Green Sabre is a specific and prominent vehicle during the storyline of Grand Theft Auto San Andreas. 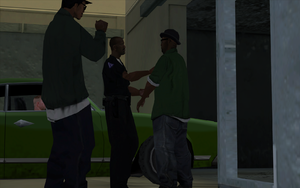 Frank Tenpenny, Eddie Pulaski, Big Smoke, and Ryder acquired a Sabre, whether is was picked out green or painted green after, it is suggested that the colour of the Sabre is either to mock Grove Street Families or to allow them to get into the heart of Grove Street so that the Ballas driving it can kill Sweet, Grove Street OG. However then plan goes sour, as the Ballas accidentally killed Sean's mother Beverly Johnson. Later on after Sean's younger bother Carl Johnson comes back to Los Santos for his mother's funeral, Varrios Los Aztecas leader Cesar Vialpando discovers the Green Sabre and the people associated with it. This is the last time the Green Sabre is seen.